092. CAPTAIN JAMES COOK. Issued by Carreras Ltd. (1935). Card number 31 from a set of 50. Size: Ca. 2.7" x 1.4". 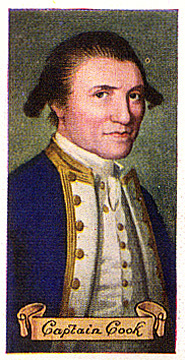 Recto: Portrait of Cook in naval uniform. At bottom: Captain Cook.